It came time to do something different on the walls in our living room. I had originally tried to do a frame collage with the intention of using wedding photos down the road (below - taken nearly a year ago). Instead, this is what we had for...well, a year now. Michael and I thought it was a bit too casual, so more formal art needed to be brought in. 2nd time posting a comment (sometimes I'm not very good at this computer thing!). Love the new art! Creative, artsy, beautiful! I'll say it again, you are talented. Also, really like the sofa table. Where did you get it? Looking forward to seeing your next project. How is Little Miss Paisley? Hope you are all well and staying warm. Talk to you soon! I love love love this idea! Thanks for sharing. Thanks ladies! It was actually pretty easy, though you will notice I didn't space them that well when painting :( Oops. Chrisi, the table is from World Market. Love it....nice and heavy and has a neat texture on top. I just went on the website and don't see it specifically, but it's the Sourav line. Greetings from Houston, TX! 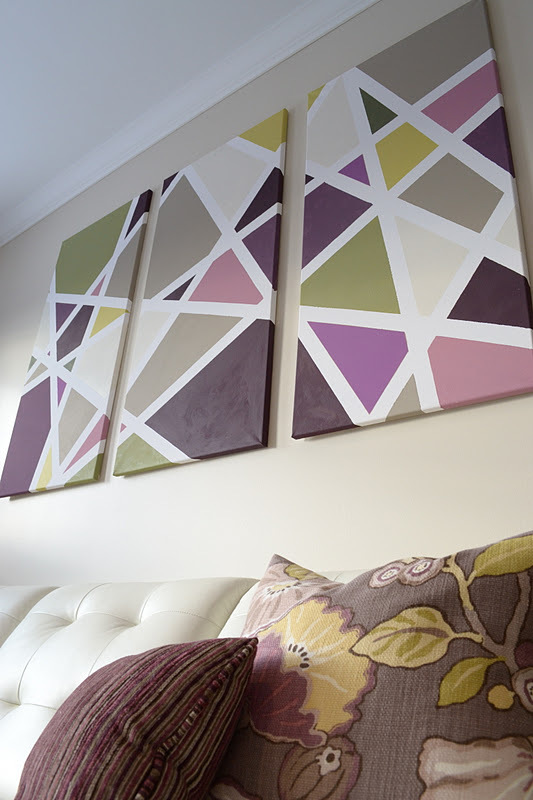 Love, love...your colors and design of your paintings and décor! My only side note, not meaning to be a party pooper but I would think that this project would cost a bit more than just $15. The 3 canvases, the painters tape, paint brush would add at least around $25. A lot of folks don't have those exact items laying around and would have to be bought. But, I so love what you created. Thank you for sharing!! Beautiful!!! What size are the the canvases? They were 12 x 36" each! Funny I have since moved to a new house and decorated and renovated a bit for the last 3 years so it's interesting to still get comments on here! If I didn't have 3 tiny humans to take care of I might document our new house. You can follow me on Instagram though via Canadianhomelove. I do post a bit there!